Just in case you're not, let's look at courses you can take to become one! Brown v. Board of Education. Whether you’re already a law buff or just excited to start taking it all in, I imagine you’ve heard about these cases in a history class, or the newspapers, or both. In fact, they might have been the very cases that first piqued your interest in law, or inspired you to go to law school. (One that inspired me: Ricci v. DeStefano, which I could have debated for hours. Look it up!) In some ways, cases like these are the very foundation of the entire legal system you’ll be studying in law school. What do these cases have in common? They all involve interpretation of the U.S. Constitution -- Constitutional Law -- which is the Supreme Law of the Land. “Con Law” is without a doubt one of the essential law school subjects. Despite its relatively short length, however -- my last count puts it at a brisk 7,591 words -- the field of Constitutional interpretation is much too big for one or even two law school classes. 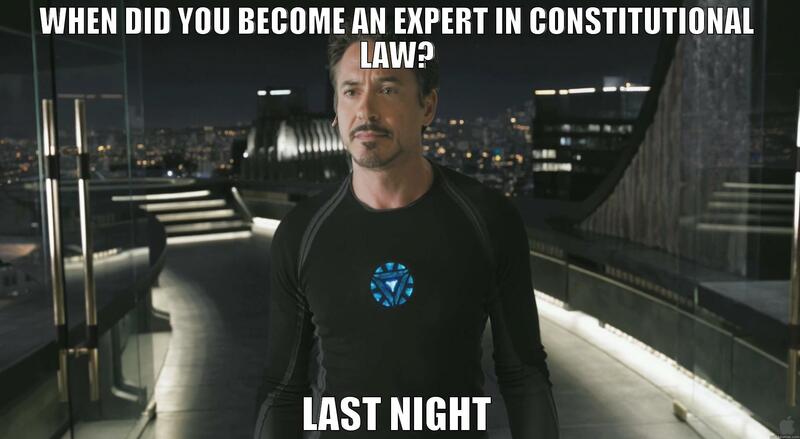 So, what Con Law classes are there, and which should you take? The course names and delineations will obviously vary a bit from school to school, but here’s my general breakdown. The original Constitution itself -- before the Bill of Rights was tacked on -- creates a delicately balanced government, with three federal branches perched on top of the existing state-government structure. Despite what some Tea Partiers might have you believe, the federal government’s power is not unlimited; in fact, the power of each branch is constrained by the text of the Constitution -- and the Supreme Court’s interpretation of that text. What, exactly, is Congress entitled to do? What about the President? And how much say does the Court get? Take this extremely important and relevant course to find out. Ah, freedom. The First Amendment to the U.S. Constitution -- and subsequent caselaw interpreting it -- protects our right to say whatever we want… sometimes. There’s a lot of speech that’s protected, to be sure, but there’s plenty that isn’t -- and you’d be surprised what protections of “speech” can sometimes cover. (Citizens United, anyone?). Can you scream hateful things at a funeral? Join the Communist Party? Praise terrorists? Burn a flag? The strange cases are endless… and the discussions of them unforgettable. Plus, you get to see where religion fits -- or doesn’t fit -- into our entire scheme of government. My personal favorite! What can the police do when they stop you? Do you really have the right to remain silent, or do they just say that in Law and Order? What’s a grand jury, and rights do you have before one? While most of these are issues of state law, the Constitution protects many of criminal defendants’ most fundamental rights (oftentimes against zealous state law enforcement issues). Not only is this solid Constitutional analysis, it’s probably one of the most practical cases in law school… just in case you ever get pulled over by a cop! Plus, you might even get to study Jay-Z lyrics. The rules may be hazy, but it’s a good course nevertheless. The so-called Reconstruction Amendments (13-15), adopted in the wake of the Civil War, form the very basis of legal equality in the United States. Discrimination, affirmative action, abortion, gay marriage: there’s barely a social issue in America today that the Due Process and Equal Protection Clauses of the 14th Amendment don’t touch. Take the debates we have as a country, inject the law and some brilliant legal minds, and get to advocating! The rest of the sign should read: "Our 14th Amendment Equal Protection"
Uh oh. This is the one I never took, so I’m going off secondhand information, but from what I’ve heard this is one of the most convoluted subjects in all of law. Probe the tangled relationship between state and federal courts -- governed by Article III and the Eleventh Amendment, and just try to come out alive! (That being said, I’ve heard this is an essential course for anyone interested in being a judicial clerk.) If you can handle Fed Courts, you can handle anything else in law school. No wonder this is so confusing! “But, wait,” I can almost hear you asking, “aren’t there a whole lot more Amendments and Articles to study?” Well yes, of course! Some of them -- the 2nd Amendment’s protection of gun ownership, the 8th Amendment’s prohibition on cruel and unusual punishment -- are extremely well-known, and controversial, but just haven’t generated the kind of jurisprudence that keeps law school classrooms humming. (Maybe one day you’ll bring the case that does?) But, I wouldn’t be too worried. There’s plenty of Con Law to be learned. Enjoy learning it! For more reading on law school for incoming law students, check out these posts: 6 Essential Law School Cases: a 1L's Guide, Which Law School Movie Should You Trust? Paper Chase vs Legally Blonde, How the LSAT Will Help You With Law School. Looking to work with a law school tutor? Feel free to get in touch! Cambridge Coaching offers private in-person legal studies tutoring in New York City and Boston, and online tutoring around the world.